The second M2M Challenge 2013/14 closed its database on November 30. The competition was more successful than the year before, which demonstrates the rising attention towards machine-to-machine communication. An international jury of experts evaluated the submissions to determine the finalists of this years competition. 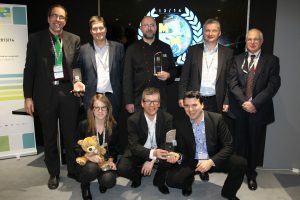 The winners were awarded at the Ericsson booth, during the Mobile World Congress in Barcelona, on February 24th. The tradeshow is the meeting place for the mobile communications industry. The most important representatives from the industry meet up in Barcelona. In 2014, more than 85,000 attendees from over 200 countries were treated to a wealth of learning and networking opportunities; product showcases and announcements; inspiration and innovation.